​My 2nd great-grandfather, Daniel Joy, had an older brother, Thomas, who remained in Yorkshire, earning a living as a Gamekeeper at Middleton Lodge in Ilkley. He married and had one son – Augustus Bowdin Joy. The Sheffield Independent of 24th October confirmed a new patent granted to A. B. Joy for bottle and barrel stoppers. The Huddersfield Chronicle of 30th September 1880 gave notice of the dissolution of the business partnership between Augustus and Orlando. [This, perhaps due to the latter’s failing health - he died a year later of sclerosis of the liver!]. The Leeds Mercury of 3rd February 1881 reported on the sale of the property known as the Lister’s Arms, which included the Ilkley Wells Brewery, occupied by Mr A. B. Joy. The Nottingham Evening Post of 10th September 1881 confirmed a new patent granted to A.B. Joy, Ilkley, for “Improvements in apparatus for the conversion of animal energy and gravitation into rotary motion”. As well has having a somewhat hectic business life, there were also developments in Augustus’s personal life. The Leeds Times of 24th September 1881 announced the marriage of Augustus Bowdin Joy, brewer, to Elizabeth Brumfitt. Their daughter, Hilda Mary Joy (known as Mary), was to be born a year later. Alas, despite Augustus’s undoubted spirit for innovation, it seems that this was not matched by his entrepreneurial nous. For, following the announcement of the liquidation of his business in the January, The London Gazette of 24th July 1883 declared that A.B. Joy was bankrupt and called for creditors to submit claims. This failure seems to have put an end to Augustus’s business ambitions. Indeed, I have no further information at all about Augustus until his listing in the National Probate Calendar, confirming his death in 1899 in Massachusetts, where he was working as a ‘Night-watchman’. His effects of £83 11s. 1d. went to his widow, Elizabeth, who was still living in Ilkley with their daughter, Mary Joy. Yorkshire Post and Leeds Intelligencer, 25th January 1909 – a charity matinee at the Leeds Queen’s Theatre. Among the highlights of the entertainment was a reproduction of the musical dramatic sketch called ‘The Death Waltz’, which featured Miss Mary Joy. Yorkshire Evening Post, 29th October 1910 – Miss Mary Joy, very well known on the concert platform in Yorkshire, made a charming Princess Melaneh in York Operatic Amateur’s production of ‘A Country Girl’. Yorkshire Evening Post, 30th November 1910 – two upcoming charity concert evenings to be held at the Theatre Royal in Leeds. Taking part would be ‘one of the most talented ladies in the York Amateur Operatic Society’, Miss Mary Joy – and the paper featured a photograph of the said lady! Yorkshire Evening Post, 15th July 1911 – Miss Mary Joy to reprise her role as Princess Melaneh, in the County Comedy Company’s production of ‘A Country Girl’. Yorkshire Evening Post, 28th October 1911 – at least two members of the County Comedy Club are likely to go over to the professional stage …Miss Mary Joy will probably join a musical comedy company – this article features another lovely photograph. Yorkshire Evening Post, 17th February 1912 – the many Leeds friends of Miss Mary Joy …will be glad to hear that she is delighted with her experience on the professional stage. She is touring with Mr Robert Courtneidge’s company in the ‘Mousme’. It seemed that Mary’s star as a performing artist was well and truly in the ascendancy. But then, on 22nd June 1912, the Yorkshire Evening Post reported that at the annual outing of the County Comedy Club at Boston Spa, the members said au revoir to ‘Miss Mary Joy [who] sails on the 27th inst. for Canada, where she is to be married’. ​​On 27th June, Mary set sail aboard Corsican from Liverpool to Montreal. And then, on 11 July 1912, she married Yorkshireman, Norman Stones, in Vancouver, British Columbia. Norman Stones was the son of George and Sarah Jane Stones (nee Holroyd). Norman and Mary had family connections through marriage and it is more than likely that they met at one of many family gatherings in and around the Ilkley area. Norman graduated with a degree from Leeds University in 1909 but had also gained practical experience of farming. While Mary was fulfilling her final commitments on the stage, Norman had struck out for a new life in the New World and had set himself up as a ‘Rancher’ (Canadian equivalent of a cowkeeper, perhaps?) near Van Anda, Vancouver – a settlement on Texada Island, the largest island in the Strait of Georgia, located between the mainland and Vancouver Island. Vancouver is located in British Columbia, on the western seaboard of Canada, just north of the border with USA. ​Since the days of the early fur trade, British Columbia's economy had been based on natural resources, particularly farming, fishing, logging and mining. With industrialisation and economic growth, workers arrived from all over the world to join in the new prosperity. Many of these immigrants came from Europe, in search of a better way of life. Norman and Mary were part of this influx of new settlers. The records show that in subsequent years, Mary made various journeys abroad, either crossing the boarder into USA, or catching a ship back to England to visit her mother. She sailed from Quebec to Liverpool on the Empress of Britain, arriving on 22nd May 1913 and then returned to Canada on 19th July aboard the Laurentic. ​In 1914, British expatriates watched with concern at the rapid escalation of hostilities in Europe: Austria declared war on Serbia; in support of Austria, Germany declared was on Russia (who was allied to Serbia) and on France (who was allied to Russia). Although Britain tried to remain aloof, when its ally, Belgium, was invaded by German troops marching on France, it too entered the war. Mr and Mrs Stones found themselves torn between their new life on their ranch in British Columbia and the events taking place in their homeland. Being part of the British Empire, Canada was automatically committed to war; whereas the USA continued to resist all pleas for it to enter the war. Eventually, Norman decided that he could not stand by while his countrymen fought for their freedom. He could have signed up in Canada and then been shipped out to Europe from there. But, that would have left Mary running the ranch on her own without any family. So, the decision was made to sell up and move back home. Their intention was for Norman to join the Officer Training Corps attached to Leeds University, while Mary would look after her ailing mother, in Headingley. At the end of June 1915, they left their ranch and travelled across Canada, coast to coast. Once they had reached the eastern seaboard they travelled south, crossing the boarder into the USA and boarding a ship in New York, bound for Liverpool. The ship they boarded was the largest passenger ship in the world at that time: the Cunard-owned RMS Lusitania. The ship set sail for Liverpool, crossing the Atlantic Ocean, on 1st May 1915. This, despite a newspaper advert posted by the German high command, reminding everyone that the waters around Great Britain were considered to be a war zone and warning of the dangers of sailing on the Lusitania. On 7th May 1915, 11 miles off the southern coast of Ireland, RMS Lusitania was torpedoed and sunk by a German U-boat. The following day, in common with all newspapers in England, the Yorkshire Evening Post announced ‘The World’s Greatest Sea Crime’ - the sinking of the Lusitania. It reported on a Leeds man with local family connections, a Mr Stones, who had survived the sinking but whose wife had been lost. It went on to say that Mrs Stones was known locally as Miss Joy. Over the next few days, more information began to emerge. 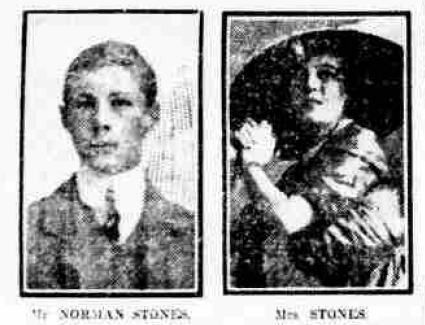 Amongst the passengers were Mr and Mrs Norman Stones, who were returning from Vancouver to Leeds. Mrs Stones had large number of friends in Leeds, particularly in amateur theatrical circles, and the news of her tragic death will be big shock to them. Mary Joy, as she was when she was taking part in the County Comedy Company’s productions, was a general favourite. She had a very jolly disposition, and her stage talents were good enough to secure for her a professional engagement in pantomime. She possessed a very fine voice. Deep sympathy will be extended to her mother, who was looking forward to her daughter’s return to live with her in Headingley. Mr Stones is amongst the rescued, but his wife, unhappily, is amongst the victims. Mr Stones is the son of the late Mr George Stones, who formerly kept the Man and Saddle Hotel, Dewsbury. His aunts, Mrs Brumfitt and Mrs Jones, now keep the hotel, and the first-named went to Liverpool on Friday meet Mr and Mrs Stones. Mrs Brumfitt, like the other anxious relatives who were waiting at Liverpool, had a very trying time, and was greatly distressed when news came through that her nephew's wife was amongst the missing. The deceased young lady was well known in Leeds, having been a member of the Leeds Amateurs and the County Comedy Company. She took leading parts in the production of "The Country Girl,” "San Toy,” and "Merrie England”, and secured engagement with Mr Robert Courtneidge’s professional company. She went to Vancouver and married Mr Stones about three years ago. Her mother, Mrs Joy, who lives at " Normar,” Far Headingley, Leeds, has lately been in indifferent health, and it was on this account that Mr and Mrs Stones were returning to England. Mr and Mrs Norman Stones, says the Ilkley correspondent of the "Mercury”, have a very close connection with Ilkley. Although Mrs Stones had resided a few years at Headingley, her whole life had previously been spent in Ilkley, and both she and her husband were connected with two of the oldest and best-known Ilkley families. In Ilkley Mrs Stones was better known as Miss Mary Joy, and possessed considerable ability as a vocalist. She was particularly fond of theatrical and operatic work. Despite the couple leaping into the sea to escape the sinking vessel, the subsequent search for survivors failed to locate and recover the body of Mary. At the time of his interview, Norman also reported that he intended to enlist and kill as many Germans as possible; it seems he was as good as his word. He left the Leeds University Officer Training Corps on 29 September 1915, with the rank of Second Lieutenant, and joined the Manchester Regiment. He was deployed to France in January 1917 and later, as acting Captain of 2/9 Battalion, was awarded the Military Cross. He reached the rank of Acting Major. Norman Stones survived the war, returned home and remarried. He died in Somerset on 7th September 1964.